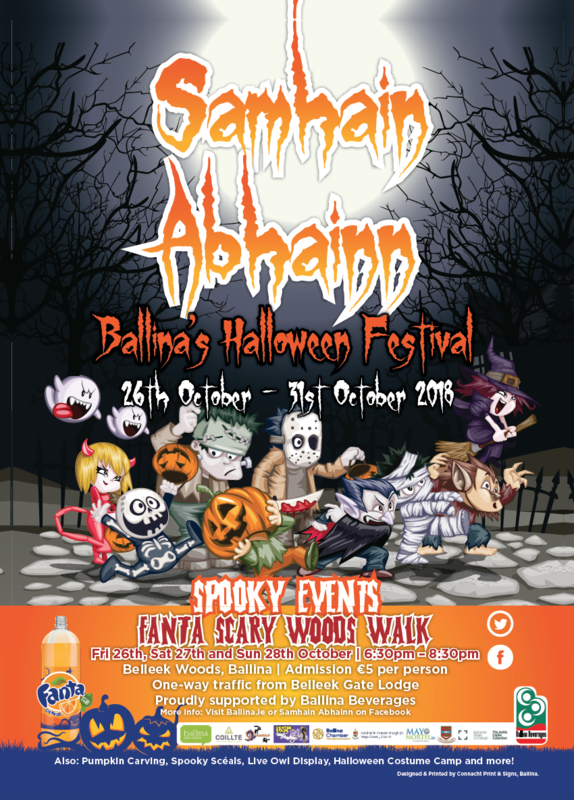 We welcome again some spooky events for this year’s Ballina Halloween Festival. The festival opens on the 25th of October with the free to enter Children’s Book Festival at Ballina Library at 10am, Monster Story Time; as part of the Mayo County Cuncil’s book festival. And just like last year’s event, the popular Scary Woods Walk (suitable for ages 7+) starts at 6.30pm, from Friday 26th, Saturday 27th and Sunday 28th, in Ballina’s Belleek Woods. Tickets are €5 per person on the night with no need to book, but early attendance is advised. Parking close to the event will be available (and please don’t bring pets as the strobe lights and smoke effects may alarm them). Saturday the 27th Spooky Scéals for 5- 12 year olds can enjoy spooky stories at The Jackie Clarke Collection on Pearse Street, Ballina, This is a free event but please contact 096 73508 to book your place. Bank holiday Monday 29th at 11am, the Moy Valley 5k / 2k Fancy Dress Fun Run returns, registration starting at 10:30AM at Ballina Soccer Club (€2 Child and €5 Adults) with prizes for the best Halloween costume. The Friendly Fiends of the Scary Woods Walk stops by for a visit to Belleek Woods for younger children (under 8 years), giving our young spooks the opportunity to meet the friendly fiends for Halloween. Enjoy the bank holiday Monday afternoon by visiting Ballina Stephenites GAA Club from 2:30pm, 3:45pm and 5pm as local Artist Gemma McG. hosts three Pumpkin Carving Workshop starts, Pre-book at the Tourist Office Ballina 096 72800. 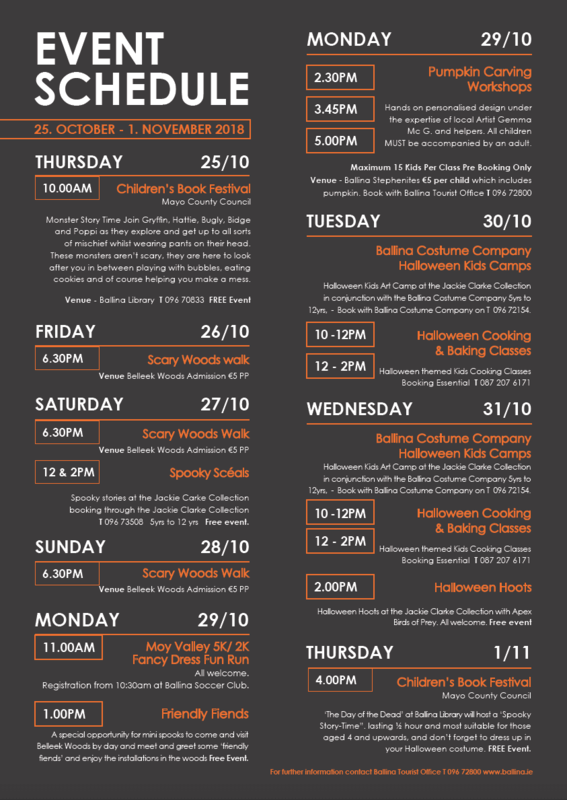 The Ballina Costume Company run their Halloween Kids Camp (for ages 5 – 12) with Art, Cooking & Baking Classes on Tuesday the 30th at the Jackie Clarke Collection starting at 10AM. Book with the company on 087 207 6171. And “See you next Wednesday” 31st October for the 2nd day of Halloween Kids Camp with the Ballina Costume Company and at 2pm we welcome the return of the very popular Halloween Hoots, a free event where the Apex Birds Of Prey put on a display – suitable for all ages, at the Jackie Clarke Collection. Lastly, on Thursday the Children’s Book Festival ends the festival with the free event ‘Day of the Dead‘ including ‘spooky story time’, lasting 30 minutes and suitable from ages 4 years. Dress to distress!